They Don’t Care About Global Warming: A polemic already past. So, what have our governments done about this? They negotiated ‘targets’ for reducing greenhouse gases. That is easy. It requires no real action on the part of ministers and no disruption to our current wasteful way of life. But government targets do not actually do anything about the problem. We must judge the seriousness of intent by the actions of governments. And here we find that what they do, or in this case, what they largely do not do, speaks louder than all the fine words. How can we believe any government is serious when it allows all our towns and cities to keep the lights on all night, every night? Britain is lit up and burning fuel while we sleep every night. The answer should be two in three lights turned off. Traffic lights could be set to amber and street signs could be turned to low levels. All public buildings should be dark, and private buildings penalised for unnecessary illumination. There should be a general move towards low intensity LED lights. Security lights should all be movement activated. This not only saves energy, it sends a very clear signal to everyone. In fact, bright light pollution, as it is recognised, is not only wasteful, but actually unhealthy for us all. I recently flew in to London late evening on a clear night and was at first amazed by the lights and then appalled at the waste. 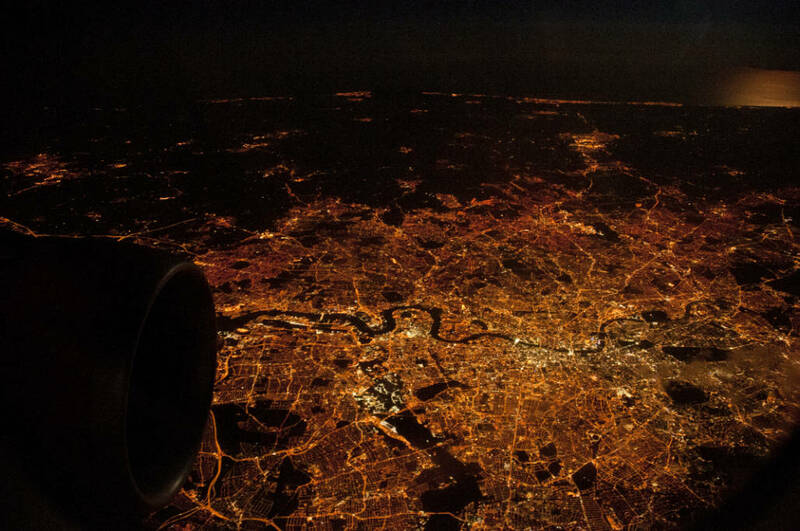 Light pollution: London at night from the air. Image by Jkarjalainen via Wikimedia Commons. How can we believe government when it allows the motoring lobby to continue to argue that motorists are badly treated? Private motoring is a major energy user and polluter. Admonition does not work. It has to be controlled by price and supply. It is already the most heavily subsidised activity in the economy if we properly account for its full costs and externalities. Far from mitigating the consequences of increased petrol prices, it should be pushing through even greater increases. The marginal cost of motoring has fallen in recent years in real terms while all other modes have increased substantially. Most cars have one occupant and most of them are stationery for more than 95% of their lives. This discouragement should be allied to an improved road system which itself would provide serious energy saving by making motoring more efficient. How can we believe this Tory government when after twelve years it has failed miserably to invest in public transport, and that means mainly the railways? We are the last country in Europe to electrify our rail system. And still there are no plans to do all it now. We even plan to buy new diesel trains! The dreadful failure of the Major denationalisation has not been corrected. Investment in rail has been totally inadequate. How can we believe in a Conservative government which supports a third runway at Heathrow while decrying the expansion of leisure air travel? All the arguments of the business community for this runway, led by British Airways, are spurious. Since business travel is less that 30 percent of Heathrow movements and one third of flights are domestic and the majority of interlining is on to local services, the whole economic argument is rubbish. But we must doubt Conservative governments for other reasons than lighting and transport. We have the lowest level of investment in domestic insulation in Europe. Very little real support is given to alternative heating such as thermal converters and solar panels. Privatising energy supply has removed all the serious possibilities for a genuine national energy policy. The government just stands there and bleats about ‘shopping around’ for the best deal. This is such rubbish because the administrative and managerial inefficiencies of a dispersed energy industry nullify any conceivable competitive benefits. And since all energy comes from the same wire or pipe, can we really believe in competitive supply as a realistic option? In fact, we should be increasing domestic energy prices as much as possible. And using the excess profits to increase pensions and welfare payments, and at the same time subsidise energy for low-income households so they can afford heat and light. In present circumstances, this is not possible. In any case, the Treasury would insist on means tests, which would mean half the money would go on administration! This policy would be a real use of supply and demand, not the present nonsensical privatised energy industry. How can we believe in a government that abandons all hints of managing the one crisis that will not go away? The private sector cannot do this because the market is always short term. We rely on governments to take the big decisions and think long term. But as long as it is dominated by the Treasury, and elections are won by offering the electorate tax bribes, there is no hope. Tackling the energy crises, the result of global climate change, and the finite supply of stored energy, is going to cost more than anyone is yet prepared to admit. In the end it will wipe out economic growth for decades if we do not act now. All the warnings are there. Just take a look at China and India. Both are assiduously copying our model and our mistakes. Take note of the current increase in world food prices. This is being driven partly by increased use of energy to overcome seasonality. Although that problem will be solved by increasing supply, this is a warning. This government cannot be serious because it is not even doing the simple things like limiting its own transport, lighting and heating. It is not taking any sort of a lead. There is no major strategic investment programme. There is no attempt to manage the situation, which means admitting the problem, finding the very best brains, and taking proper advice. These days Cabinet Ministers are not the fount of wisdom. They are doctrinaire Tories, the capitalist equivalent of the most extreme Leninists. Most of them have only the sketchiest idea about the problems and issues they are supposed to be in charge of. We need them to be managers and get the best advice and act on it, without resorting to silly denials in favour of popular ‘common sense’. In all these matters, common sense is almost always wrong; just as panaceas only make a difference short term. We must demand that they admit the truth. The global energy and climate problem is very, very big, and very expensive and demands real leadership. It is going to cost us all and the eventual price is rising every day. Living with climate change may already be all that is left.